Last week we spoke about the ingredients of a basic pantry, what staples to have always at hand to be able to cook something from scratch at any time! Once you have flour, stock cubes, salt and all the rest, you absolutely need something in your fridge! And of course fresh fruits and vegetables! 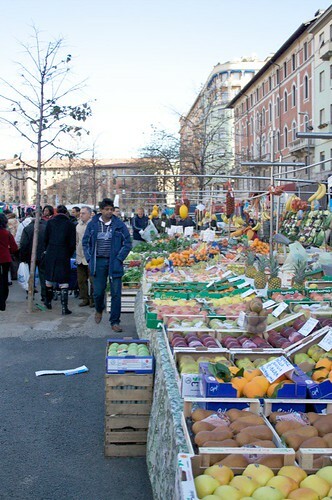 I’m very lucky: I live in Italy and markets always look like the one in the picture above (it’s actually the local market not far form our home). But in the last years, in England or in the States, farmer markets are more and more common. And for a good choise of organic fruits and vegetable a farmer’s market is for sure the best choice. Well, primarily because it taste better. Organic fruits and vegetables are tastier and normally they are picked up at the right ripe. They are not any more so expensive and normally they last longer (don’t ask me why). And even because organic crops are, normally, more environmental friendly. Butter, 250 g at least (plus another 250 g in the freezer). Say what you want: unhealthy, too much fat, blah blah, but butter is good, especially for pastry is impossible to substitute, so butter, butter, butter! Remember what Julia Child used to say: there three basic ingredients that make Frnch cooking tastes so good: butter, butter and butter! Cheese, a melting one, like Emmenthal or gouda or cheddar, and, but I’m spoiled, Parmigiano Reggiano, the real one. Plus ricotta and/or a fresh cheese, for a quick, cold dinner. Choose the freshest fruits, always the one in seasons. If you leave in the northern hemisphere, don’t be temped by strawberries between July and April, or by peaches during the winter: they will never taste good, never! Fresh seasonal fruits have to smell good, fragrant and fresh. Choose the fruits you like and prefer. For a week you’ll need at least 1 kg (for a single it will last 2 weeks, for a couple 1 week) of mixed fruits. Like for fruits, choose the freshest vegetables, always the one in seasons. If you leave in the northern hemisphere, don’t be temped by asparagus between July and April, or by peppers during the winter: they will never taste good, never! Fresh seasonal vegetables have to look fragrant and fresh, be firm and hard. Choose the vegetables you like and prefer. For a week you’ll need at least 2 kg (for a single it will last 2 weeks, for a couple 1 week) of mixed vegetables. Do not forget the basic stuff, like onions, garlic and potatoes, which should always be present in your pantry. Choose the freshest, better directly from the butcher or the fishmonger. Fresh meat and fish, if it smells, smell good and have bright colours. You don’t need expensive meat cuts to have a good, savoury and earthy dish: sometimes for a good stew you need the cheapest cuts. Fish is expensive but it’s worth it, always! If you look for the little fishes, like herrings, sardines, mackerels, are cheaper, meatier and tastier. Choose the meat and fish you like and prefer. Remember to include all kind of meat, white and red. Do not eat meat every single day: try to vary your diet, with fish and loads of vegetables, rice, pasta and grains.